Players who can volley overhead have a big advantage over their opponents. Why? They cut the ball off before it gets to the back of the court. They find it easier to keep in front of their opponent. They do not get stuck in the back corners on length shots and the return of serve. This is why tennis players find they can convert to squash easily, and have a natural tendency to take the ball early. The average player finds swinging overhead an unnatural stroke. Usually the muscles are not very strong, particularly on the backhand overhead volley. Standing at the T move from forehand to backhand swinging overhead. Figure of 8 swing at hip height, then gradually move the swing to shoulder height, then overhead height. 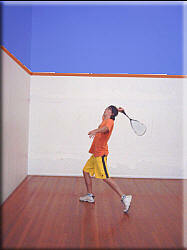 Standing near the half court line move as if to overhead volley a return of serve. These exercises are designed to compliment training sessions, and if attempted for a short time each day at home will improve your game a lot. At first you will be uncoordinated, and awkward. Try to emulate your game, with particular emphasis on footwork, racket work, and fluent movement. 2. Backhand drive, forehand volley. 3. Backhand lob, forehand volley. 4. Forehand lob, back hand volley. A good practice session would be these drills followed by solo drills, pair routines or restricted games. No videos match the tags.